LED is a non invasive light therapy that delivers outstanding results for all skin conditions and has been successfully been proven to restore youth to ageing skin, encourage cell renewal, calm red capillaries and is superior in treating acne. 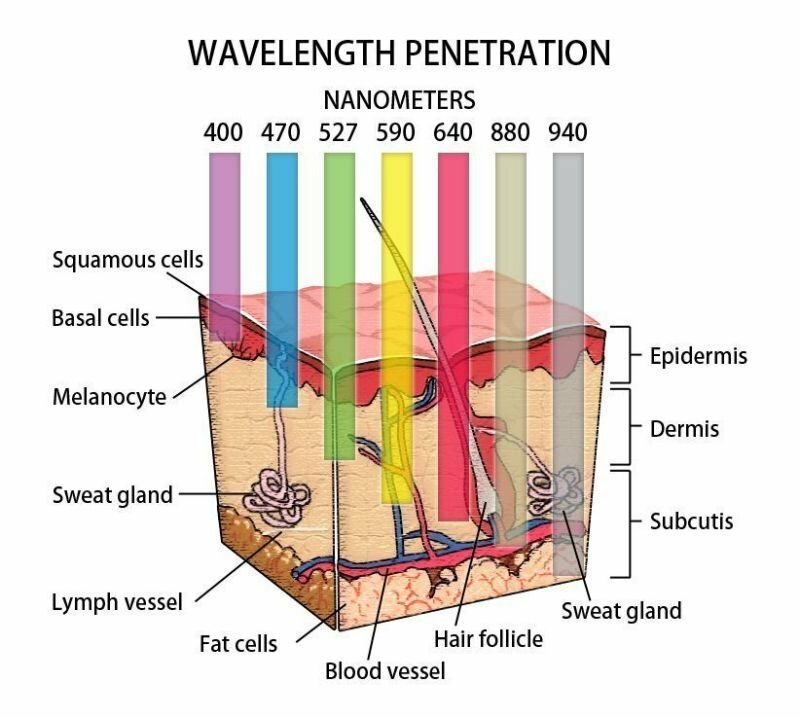 LED is a scientific process that uses wavelengths in the visible spectrum to send light into layers of the skin to activate a reaction of cellular activity. Originally developed by NASA to improve wound healing in space has now become a very successful treatment in skin care. Phototherapy is where light of specific wavelengths is delivered to the skin to stimulate and activate cellular processes deep within the skin layers. The Phototherapy machine uses LED technology to produce a range of light wavelengths to aid in many treatment applications. 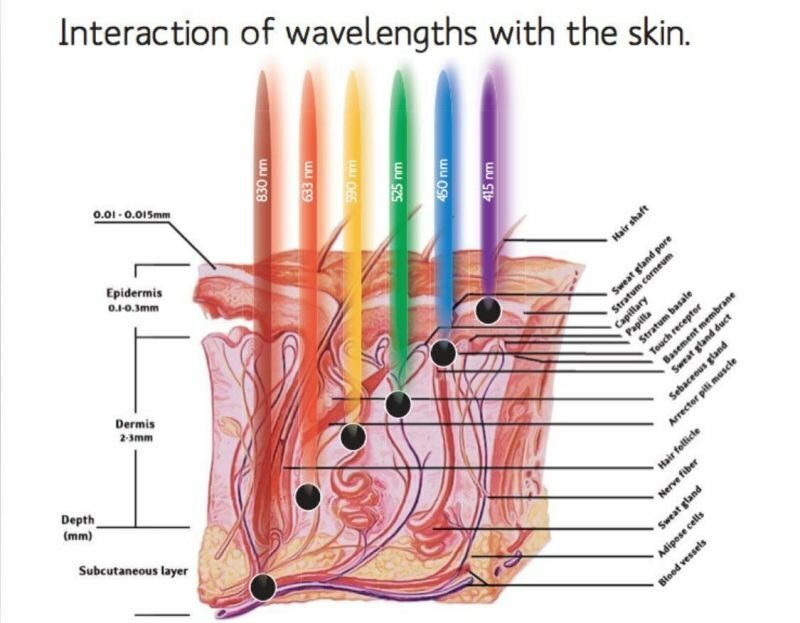 Use the spectrum guide to determine the correct wavelength of light to bathe your skin in and will help you determine the correct course of treatments depending on the results your client want to achieve. Light therapy offers remarkable results over a period of time. What skin conditions can be treated with LED Phototherapy? LED Phototherapy is clinically proven for the treatment of a wide range of skin conditions and the most common skin concerns including lines and wrinkles, pigmentation, sun damage, dehydration, open pores, acne and blemishes, rosacea and eczema. How many LED Phototherapy treatments will I need? 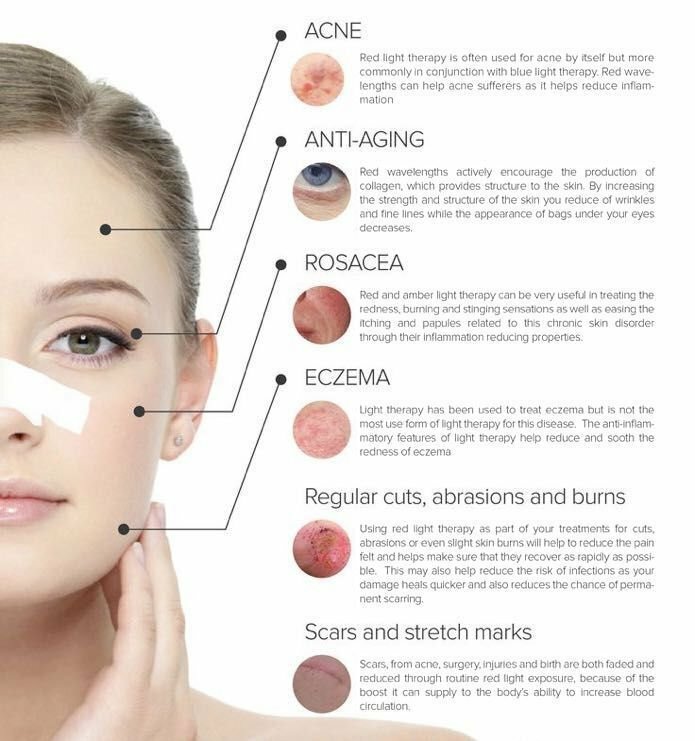 The number of treatments can vary with age, skin type and condition. With phototherapy the results are cumulative and improvement will continue even after the treatment has stopped. Treatments taken in quick succession will achieve optimum results and maintenance treatments may also be recommended. Furthermore, as phototherapy does not harm the skin, there is no limit to the amount of treatment you can have. An individual treatment plan will be discussed during your consultation. How soon can I expect to see results after LED Phototherapy? With phototherapy the visible effects are immediate. After just one treatment skin is incredibly hydrated, plump and radiant and any redness and irritation is calmed. How long will LED Phototherapy results last? Results can last for several months following a course of LED Phototherapy treatments. However, as with any skin treatment, maintenance sessions are advised to ensure lasting results. We find results lasting from anywhere between 6 -12 months. We recommend a course every year for optimum results. 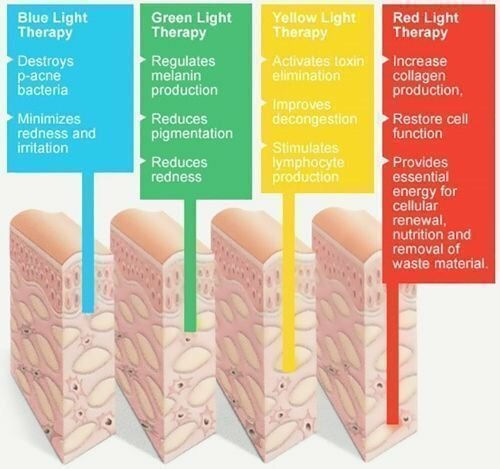 Does LED Phototherapy work equally on all skin types? The treatment times have been calculated to ensure optimum results. Darker skins may require longer exposure times to have the same level of effectiveness. Are there any side effects of LED Phototherapy? No. There is no risk of irritation, side effects or down time that may be associated with more invasive procedures. There have been no reported side effects in over 1,700 clinical studies and it does not harm the body. YES! It has been proven in numerous studies that Far Red to Near- Infrared (670nm) LED photo rejuvenation does not harm the human body. The energy delivered is safe for all skin types. LED is 100% safe, all skins and all conditions. What does LED Phototherapy feel like? LED Phototherapy is a non-invasive and pain free treatment that promotes a feeling relaxation and wellbeing whilst rejuvenating the skin. Exposure to the light can increase serotonin levels which in turn help to relive stress, tension and headaches. Any feeling of ‘heat’ is most often due to the stimulation of blood circulation. I am taking medication from the doctor – can I still have LED Phototherapy? There are certain circumstances in which phototherapy may prove to be unsuitable. Certain medications may causes photosensitivity and specific conditions may be triggered by light. For your safety and comfort, it is imperative that any medication illness, condition or other treatment that you may be undergoing are fully disclosed during your consultation with the aesthetic therapist. Can I go in the sun after LED Phototherapy? Does LED Phototherapy produce Vitamin D? No. Vitamin D production is triggered by exposure to UV light which converts cholesterol found naturally in the body to vitamin D3. Can makeup be reapplied directly after the LED Phototherapy? Yes. The treatment should be followed by the application of suitable skin care products including a sunscreen. Makeup can then be applied. Will my skin feel different? After your first treatment your skin will feel healthier and firmer. Due to the increase of circulation, you will notice better hydration, softening of the lines, firmness and a much healthier glow. The most penetrating power, skin cell regeneration, increasing the oxygen content in the blood to stimulate the circulation of blood, activates cells, enhancing energy efficiency, promoting collagen proliferation, improving wrinkles, effective treatment of aging and products deep absorption. Bacteria killing, skin cleaning, cell activation, injury recovery, promoting protein production, acne skin sterilization, inhibition of sebaceous gland, prevention of wound infection. Improving cell's oxygen alternation function, promoting micro circulation, reducing pigment, promoting lymphatic drainage, reducing skin roughness, red spots and deficient circulations, anti redness, relieve sunburn. Skin balance function, reduce sebaceous gland oil production, stabilization, improvement of sensitive skin. Combines the effect of red light and blue light which is particularly good to treat acne and acne spots. Enhance cell energy and promote metabolism. Step 1: Apply warm water to your clients face using a face cloth or flannel. The skin must remain wet during the entire treatment. Never use the device on dry skin. Step 2: Turn unit on by pressing the power button until the unit engages. This will automatically begin in cleaning mode. Step 3: Hold the unit so that the control panel is away from the skin. Step 5: Methodically work over all areas of the face. Pay special attention to the corners of the nose as this area will usually produce the most extractions. Wipe the blade when required. Step 6: After use, turn the unit off by pressing the power button until the unit turns off. The blade may be cleaned by wiping with a damp cloth. Store the device with the protective silicone sleeve on the blade. Note: If left on, the unit will automatically turn off after 10 minutes. IMPORTANT:- ENSURE THE DEVICE IS STERILISED WITH MEDICAL GRADE ALCOHOL WIPES BETWEEN CLIENTS. Step 1: Apply a layer of serum to the face. If the face becomes dry during the treatment add more serum or lotion. Step 2: Turn unit on by pressing the power button until the unit engages. Select absorb by pressing the power button once. This will engage the pulsing wave programme. Step 3: Hold the unit so that the control panel is towards the skin. Step 4: With gentle pressure, glide the blade over the surface of the skin using a backward motion. This time you are dragging the blade instead of pushing it over the skin. The serum will gradually be absorbed deep into the skin. For best results, take your time and work slowly moving the blade at all times. Step 1: Apply a generous amount of moisturiser to the face. Step 2: Turn unit on by pressing the power button. Select absorb by pressing the power button twice.